Seems as if everyone recently in the vicinity of our living room coffee table and its disorganized sprawl of books, magazines, CDs and stained coffee cups, spotted my review copy of Houdini Pie and, with a smile, said the name aloud. The title of Paul Michel’s engaging debut novel set in Southern California during the Great Depression evokes tall-tale whimsy, something wide-eyed and nostalgic, perhaps even slightly disreputable. Larry Cyr’s distinctive cover design seals the deal with its infinite sky-blue background and lone sepia-toned Dead End Kid pitching a baseball. Only it’s not a baseball. It’s a pickaxe flung heavenward. Houdini Pie is at heart the coming-of-age story of 24-year-old Hal Gates, semipro ballplayer and bootlegger’s son. Hal growing up, like any dutiful son, is drawn again and again into his father’s shady enterprises (“waiting for the umpteenth time for the coast to be clear”). The novel follows Hal’s grudging involvement in a crackpot search for Hopi Indian treasure rumored to be buried in tunnels beneath the streets of Los Angeles. Maybe, just maybe, it’s not a hoax. After all, there’s a real-life Hopi Indian chief with a map and a femme fatale for a daughter. There’s a geologist with a Flash Gordon gizmo for locating gold. There’s a psychic. And let’s not forget the psychic’s daughter. The ballpark was small by ballpark standards; fewer than four thousand seats, but to Edith it seemed enormous. The playing field was a vast carpet of grass so green it seemed painted. The ball players, in gray or white flannel uniforms, stalked its perimeter. Some swung bats at imaginary pitches; others played catch, a few made quick, sprinting forays onto the field, a dozen steps forward then back, retrieved on invisible leashes. Isabelle’s excitement was infectious as she pointed things out—the drink and peanut hawkers beginning their descents into the stands; the grounds crew laying down the white chalk lines, the black-suited umpires clustered behind home plate like a coven of witches. Michel is a veteran short story writer with dozens of literary magazine credits over the last fifteen years. 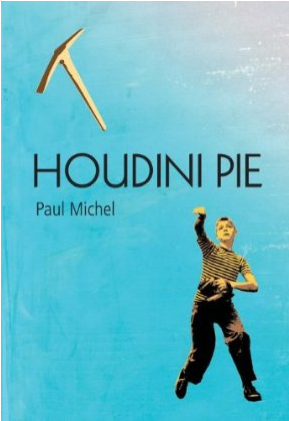 For a first novel, Houdini Pie is structurally ambitious and plotted with a clever eye for withholding information and building suspense. A bootlegging episode gone disastrously wrong early in the novel, for example, becomes clear a hundred pages later. There are incidents in which characters appear in disguise unbeknownst to us until climactic revelations. All in all, Houdini Pie is a triumph of independent small press publishing (kudos to Seattle’s Bennett and Hastings). What’s needed now—while we await another novel from the author—is a collection of Michel’s short stories.